The city tour takes you also to Cape Spartel at the extreme North-West of Africa and the Caves of Hercules which are associated with the legend of Hercules being the one who separated Africa from Europe. From this point of Africa you can have an exceptional view of the Strait of Gibraltar, the Spanish coast and the Atlantic ocean. Take a short drive from Tangier to the coastal city of Asilah, an ancient Phoenician town which has become today a small fishing harbour. 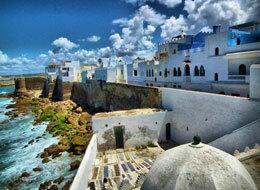 It is surrounded by crenelated ramparts, tick high walls, towers and bastions of Moorish style. Asilah organises yearly the most important cultural festival in Morocco which gathers international artists, writers and painters who leave their prints and sample of their works on the town walls. An easy walk through this charming city will take you as far as the city walls from where you have a stunning view. 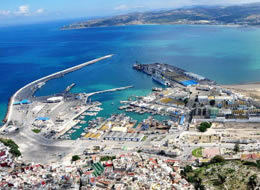 This drive will take you North of Tangier to one of the most beautiful towns of the Rif Mountains. Villages are perched 2000 feet above sea level between the two peaks that gave rise to its name, Chaouen or Chefchaouen as in the local Berber language. It is a mountains massif and the last rampart before the Mediterranean and the Iberian Peninsula. 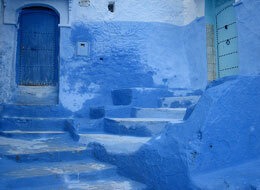 The city is famous for its shady valleys, Medina, its white houses with blues doors and tiled roofs. The local markets of Chaouen are animated with traditionally dressed locals and colourful shops with beautifully displayed crafts. 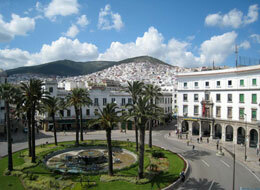 Chaouen offers to visitors the charm of a city which has preserved the Arab-Andalusian arts and traditions.